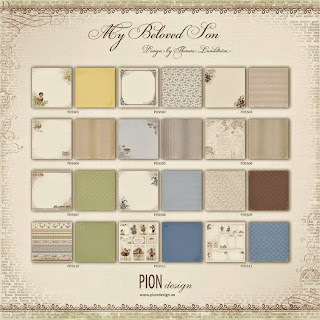 Today, we are using sponsored Pion papers over at StampARTic. 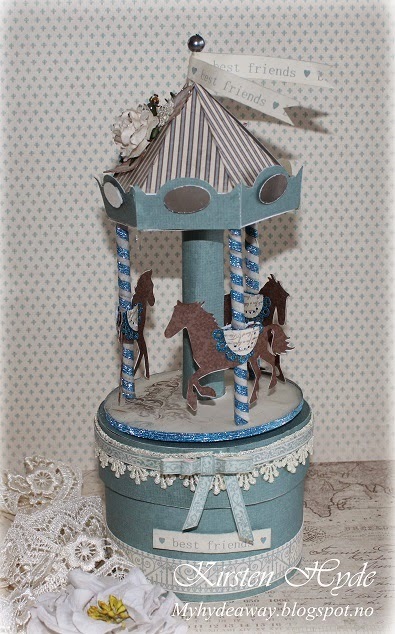 I have created a Merry go round box with papers from Pion. 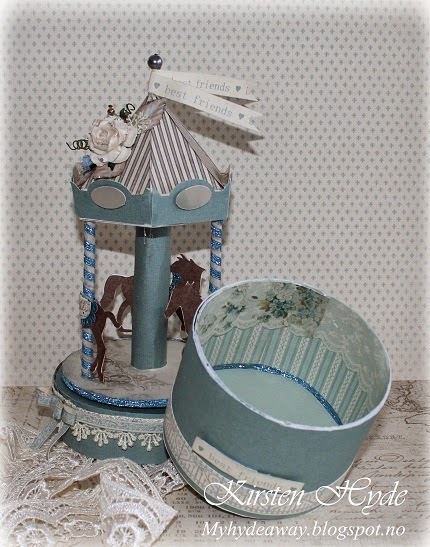 The Merry go round is on a circular box and it does turn around. I have used papers from My Beloved son collection. 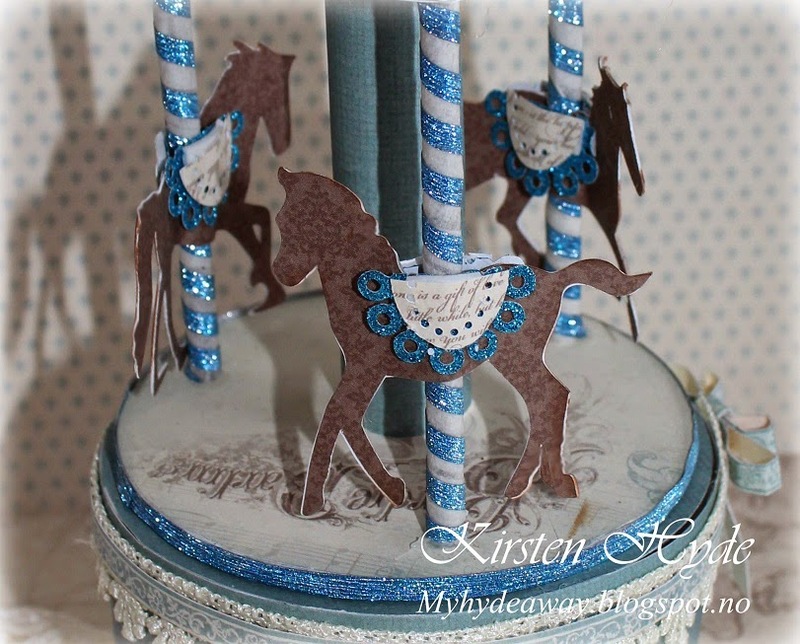 The horses have been cut from photos of some horses out of Pion papers. The supports are straws with washitape. 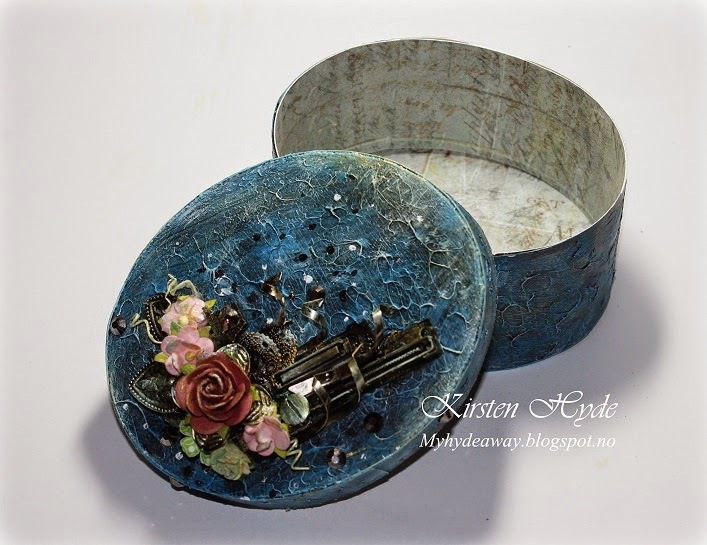 The box is also covered inside with Pion papers. Here is a little film to show the box and how it is turning around. 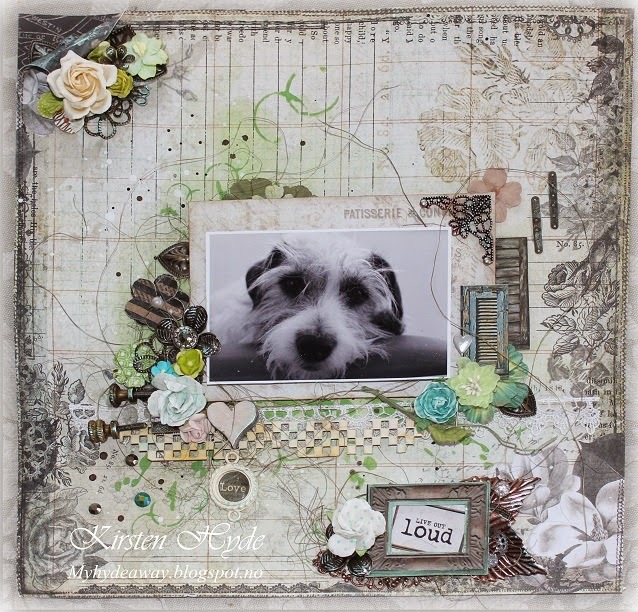 We are showing layouts with animals over at StampARTic today. 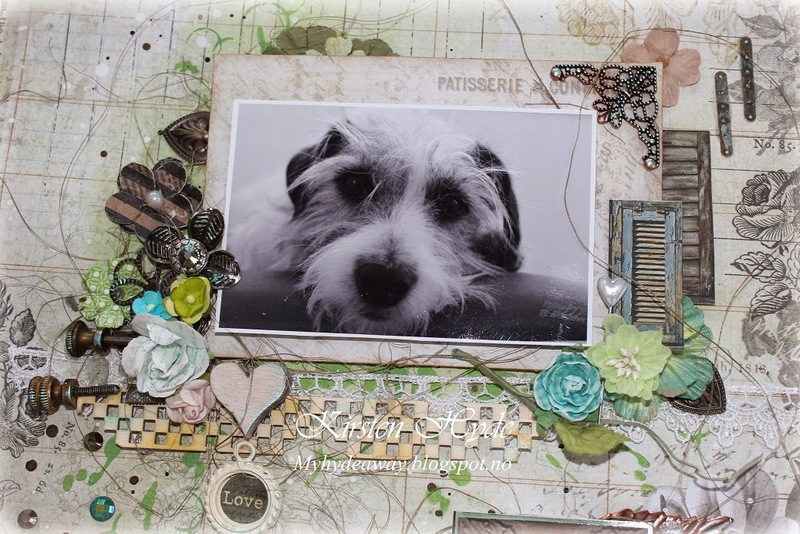 I have created a layout with my Jack Russell Terrier. 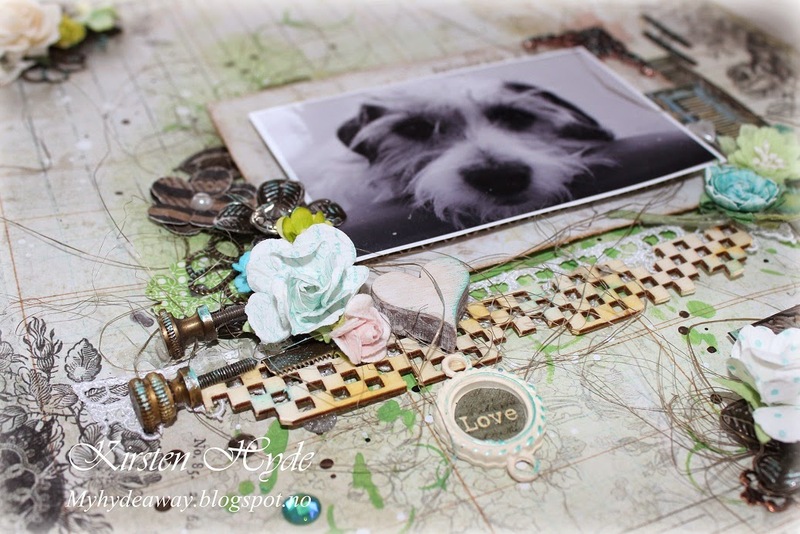 Wood icons, flowers and the "Love" embellishment are from Prima. 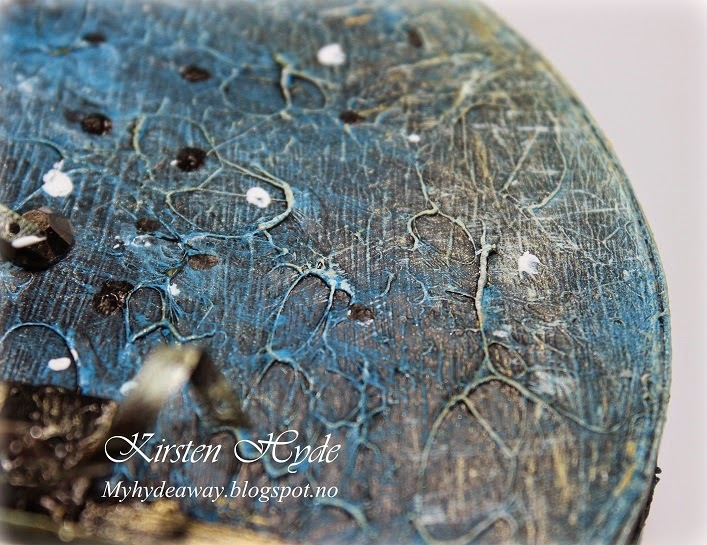 Kaisercraft: Azure Spot Varnish - Blue Bay. 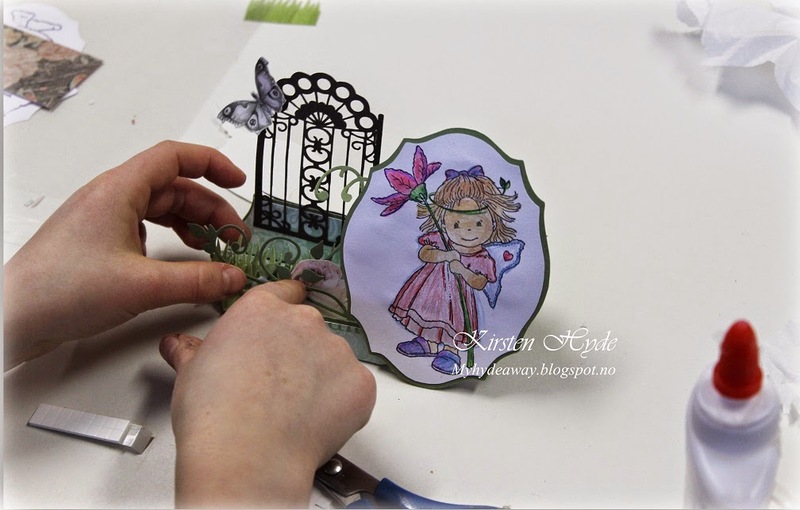 12. februar holder jeg Mixed Media kurs hos Hobbykunst. 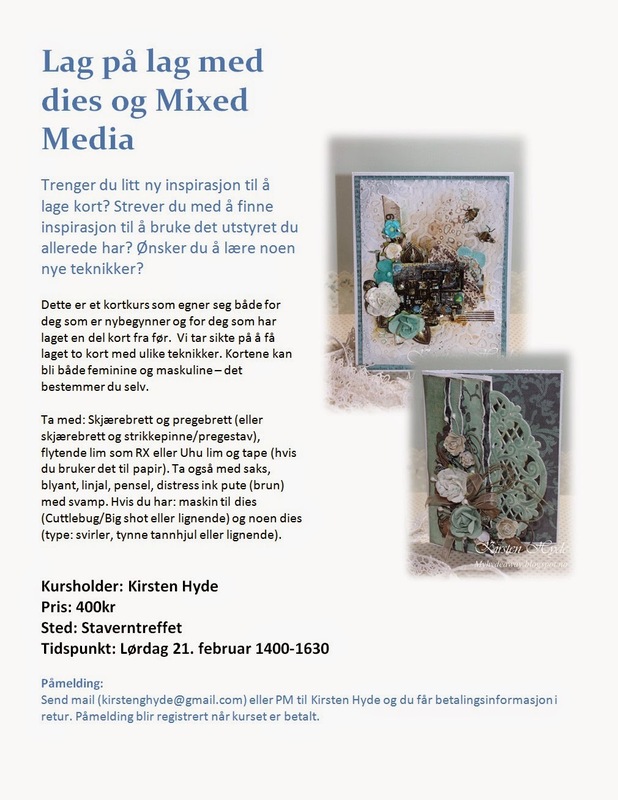 In a few weeks time, 12. of February, I am giving a Mixed Media class at Hobbykunst. 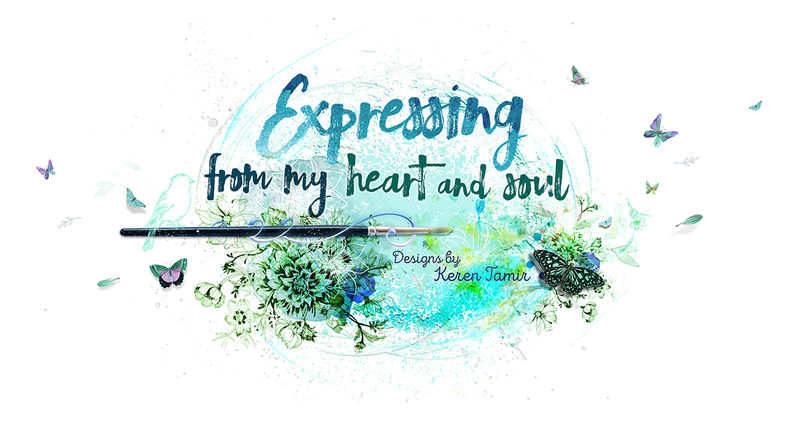 You can find more information about the class at Hobbykunst . 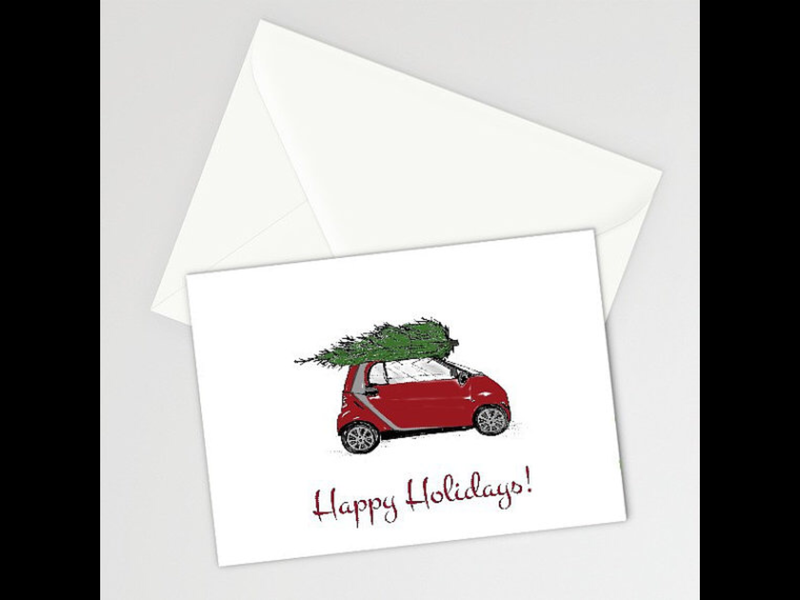 The card is clean and simple inside. 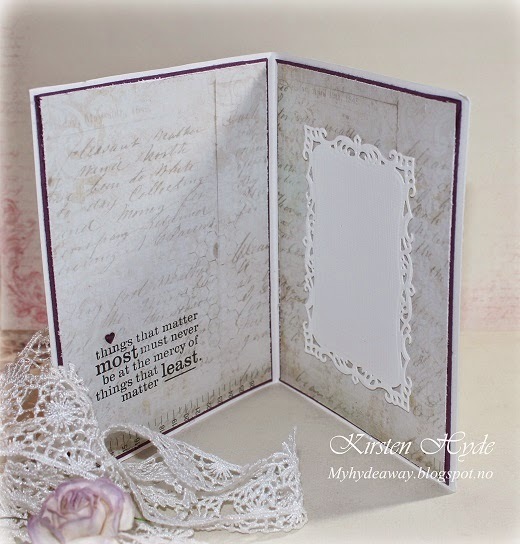 The stamp is another one ot Tim Holtz's text stamps. Hobbykunst has got a huge sale in their shop at the moment. 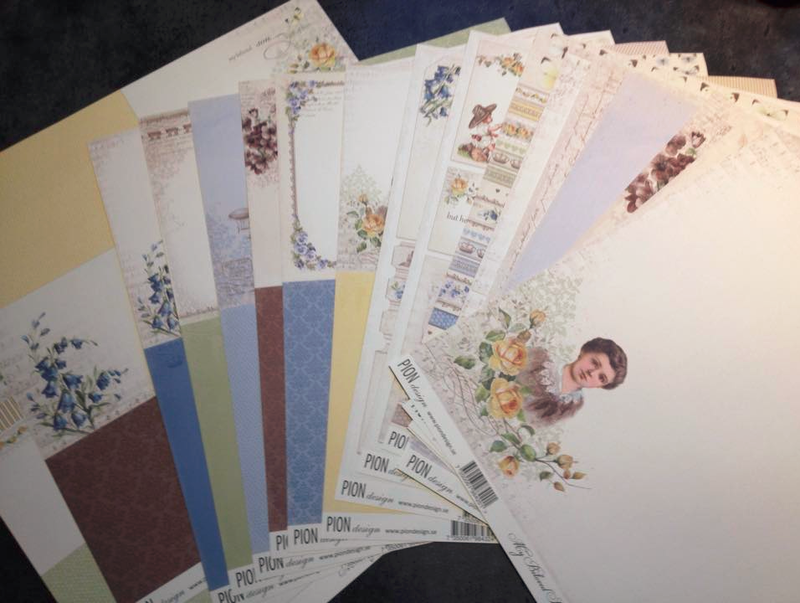 One of the papers on sale is this gorgeous Prima paper: Botanical - Walk in the Park. 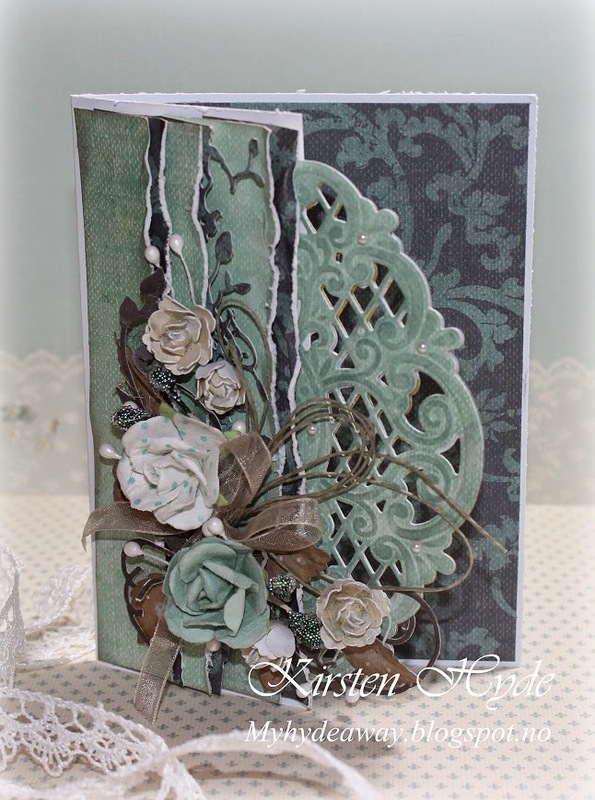 I have created an invitation card and a simple place card with the papers. 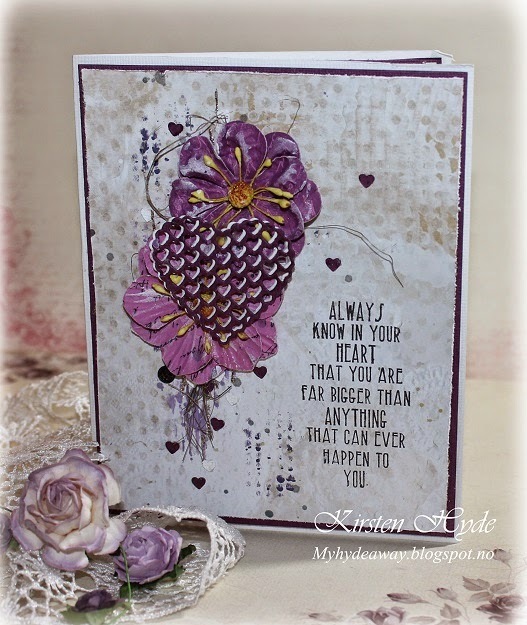 I have used flowers from Prima and Wild Orchid. 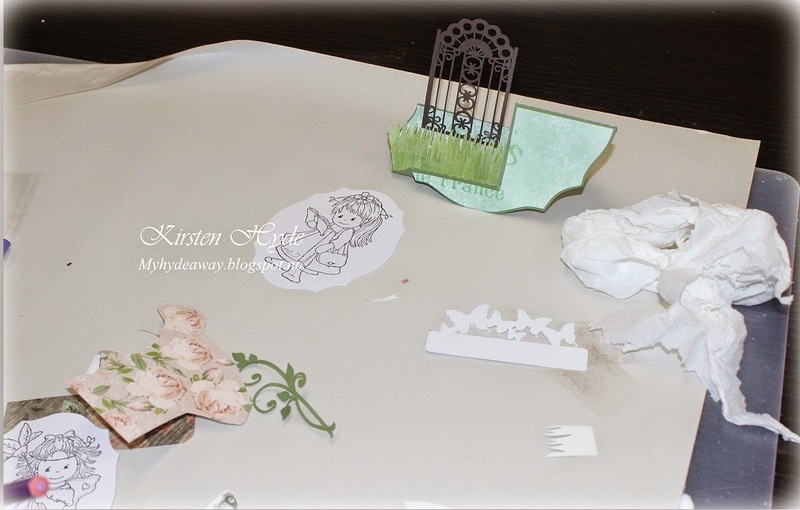 The leaf and doily dies are from Prima. The text "Invitasjon" has been written in word, and printed out. The place card, is a simple place card. 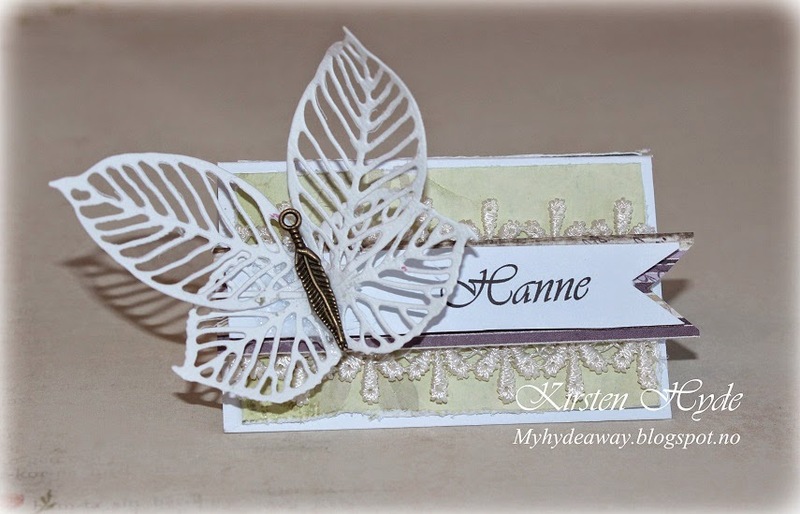 The butterfly is made with leaf dies from Prima. 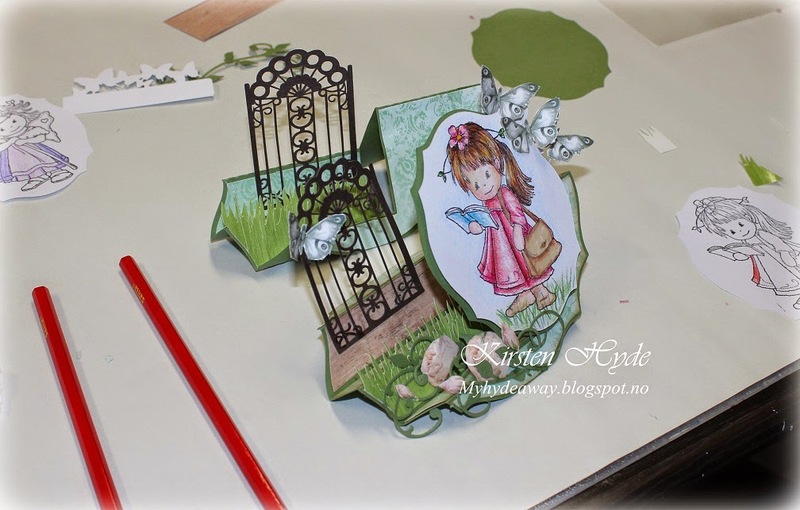 A few weeks ago, I got a Design Team task from Hobbykunst . The task was to create something out of a set of metal wings from Rayher. 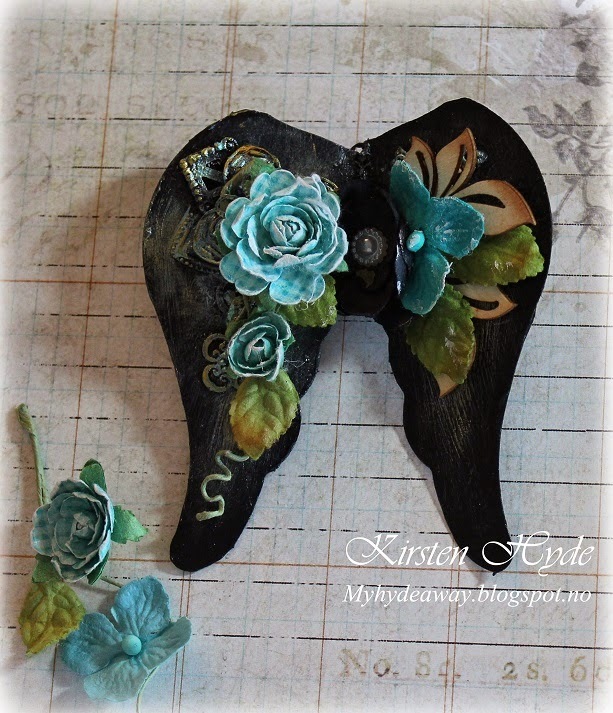 I wanted to create something different with the wings, and created a set of black Mixed Media wings, with Prima flowers and chipboards. 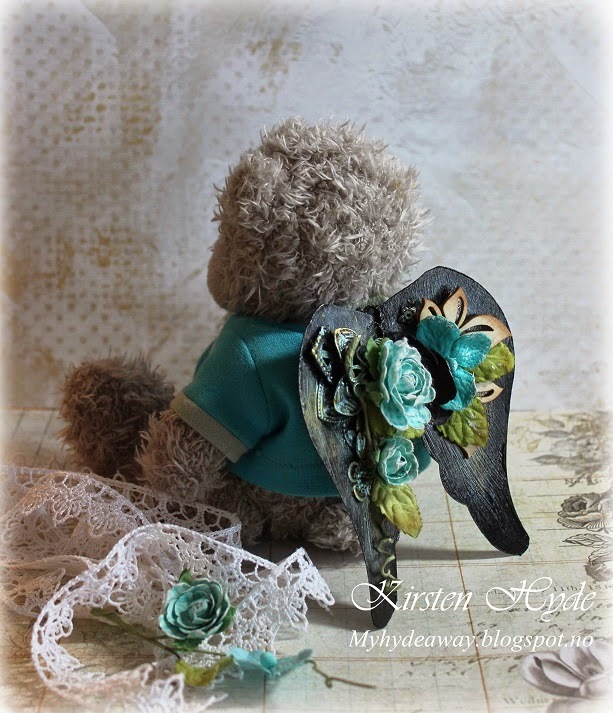 The wings has been glued to a pin (to be able to fix the wings to a teddy bear). Then. I glued metal bits to the wings, let it dry and painted everything black and left it to dry. 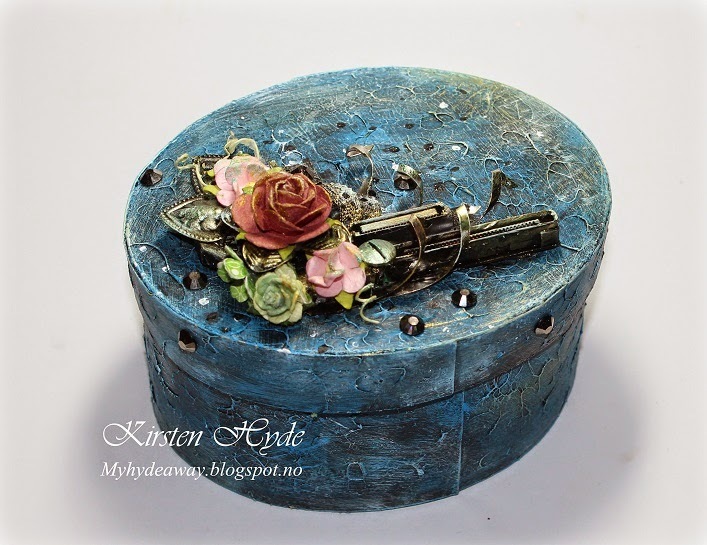 After that, I added Metamica for effect and added flowers and Chipboard leaves. The leaves has been distressed with distress ink, and I have added gesso to the flowers. The metal wings from Rayher before they were altered. The back of the wings with the pin. 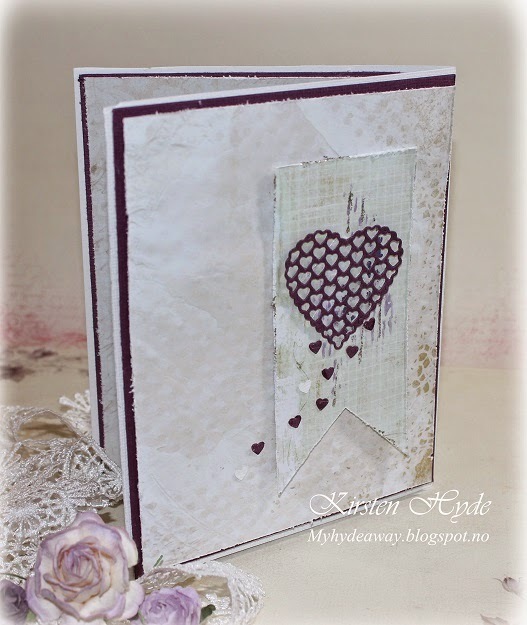 I am going to have a class in cardmaking (Layers with dies and Mixed Media) in Stavern (Norway) in a few weeks time. 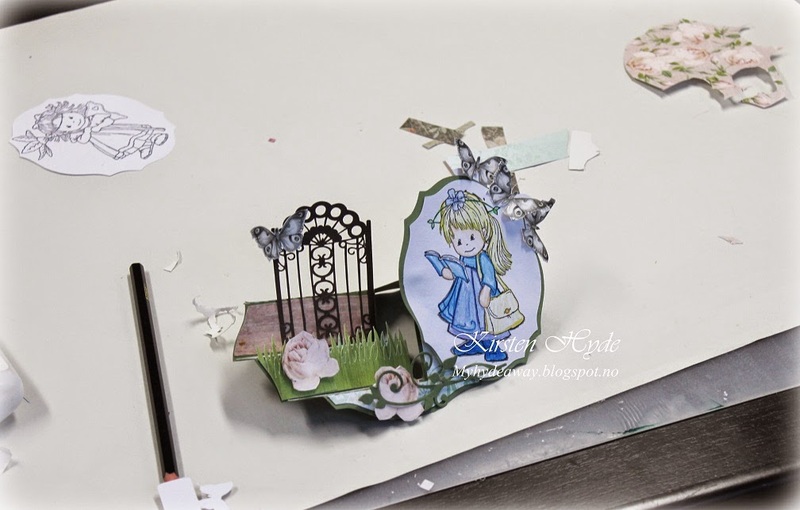 We will make two cards during the class, and this layered card is one of them. Papers are Prima. 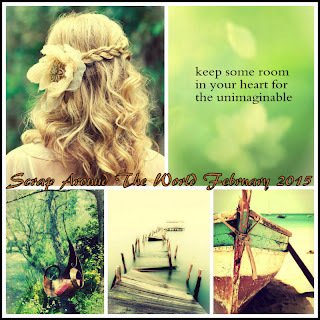 Melody - Golden Rod and Reflections collection - Caravan.. Roses are from Prima and hand made. 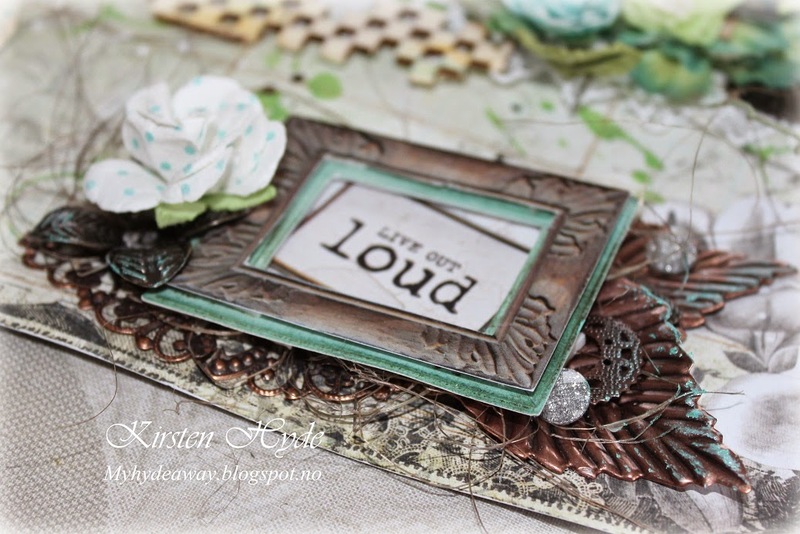 I have used dies from Marianne design - Anja's Vintage Decoration and Memory box - Kensington boarder. Utover våren skal jeg ha litt kurs. På Staverntreffet skal jeg holde to kurs. 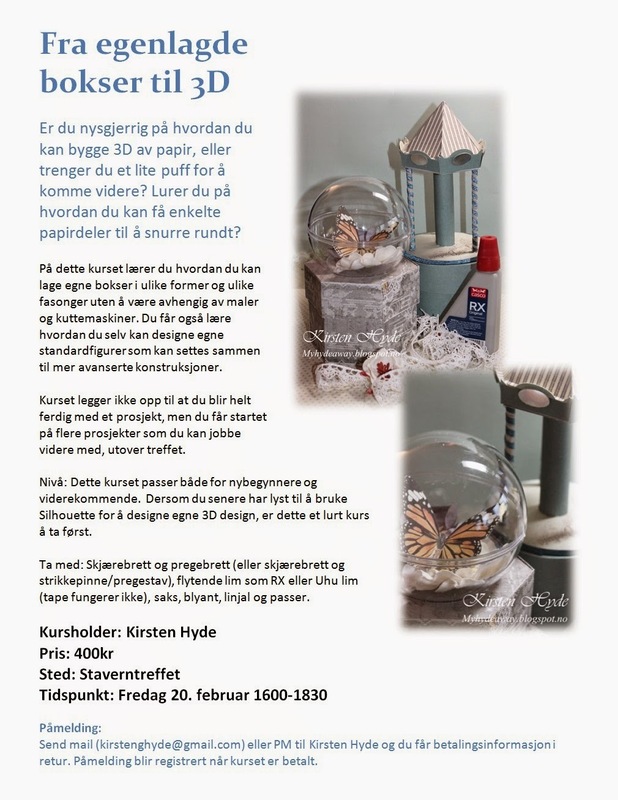 Det ene er et 3D kurs og det andre er et kortkurs med endel teknikker. 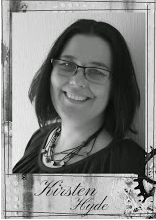 Det er mulighet til å være med på kurset selv om du ikke skal være med på treffet. 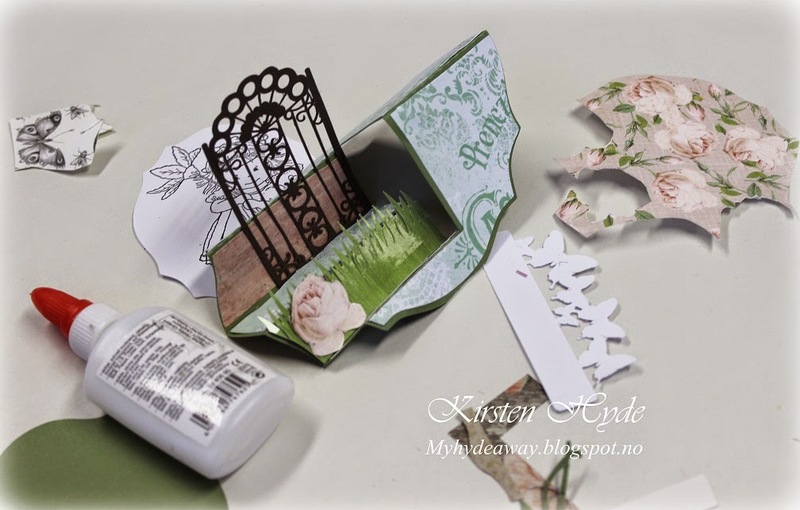 We have a new challenge over at Scandinavia paper fun. This time, everything is allowed. 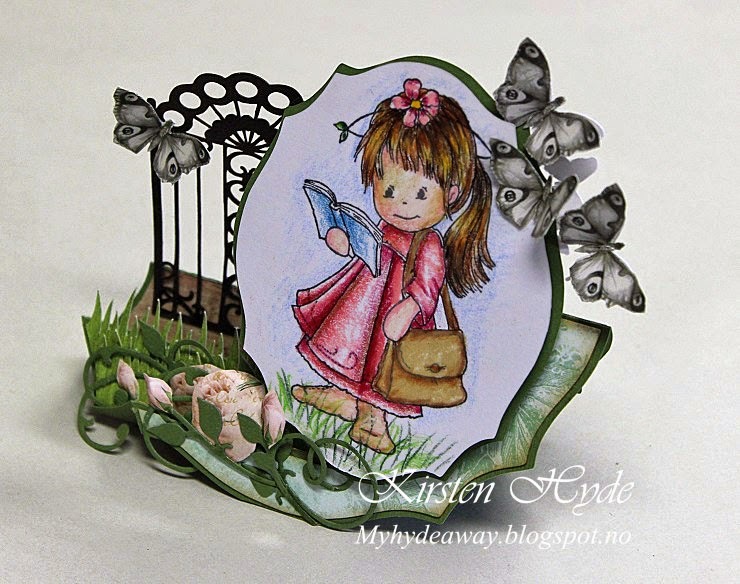 I am showing one of my cards that I made for a birthday party activity for Hobbykunst in the beginning of the year. 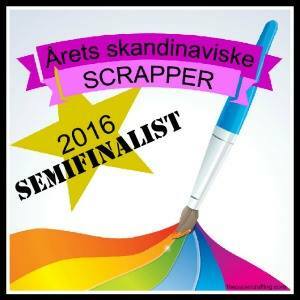 The stamp is from Bildemålarna, and it has been coloured with Prismacolors. The background paper is from BoBunny: Madeleine - Madeleine. The roses are diecuts from BoBunny: Elegance - Madeleine. 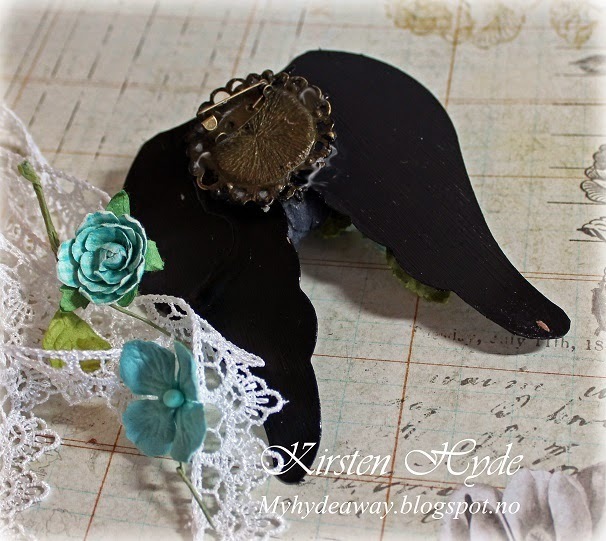 The butterflies are from an old cardstock from Poppy design.